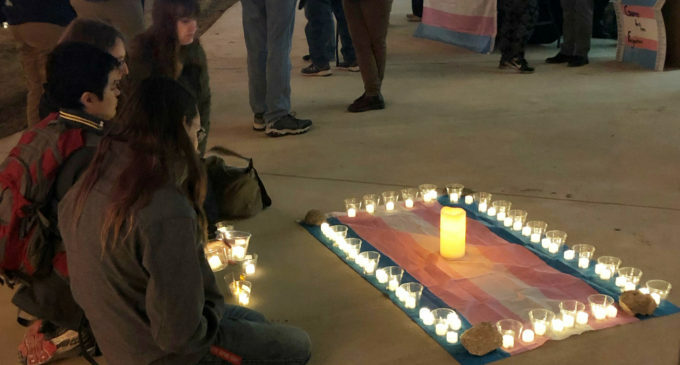 More than 75 people showed up to the Denton County Courthouse Tuesday evening to honor the lives of transgender people who have lost their lives to violence. Trans Day of Remembrance, honored on Nov. 20, was held in Denton beginning at 7 p.m. and lasted about an hour. Daniel Bryant-Gawne, 33, is the chapter director for the Denton chapter of Trans-cendence and is a transgender man. He helped organize this year’s Trans Day of Remembrance along with the UNT Pride Alliance and Denton OUTReach. Bryant-Gawne said visibility is important to normalize the transgender community and combat the fear that exists. The event began with opening remarks and a brief history of Trans Day of Remembrance, before inviting a couple people to give reflections. After the reflections, speakers began to read the names of the people killed. Candles were passed out to attendees while the names were being read. In front of the microphone, there was a transgender flag with small candles lining the edges and a big candle in the middle. There were 368 names in total and Bryant-Gawne stressed the fact that these were only the names of the reported deaths. During the closing remarks, the largest candle, placed on the transgender flag in front of the microphone, was lit. The event officially ended after the reading of the names and a moment of silence. Once the event ended, attendees hugged each other, some drying their tears. Eja Golinski, a 54-year-old office worker, attended Denton’s Trans Day of Remembrance to show support. Lauren Monroe, a 38-year-old homemaker, is transgender and said this event is a tough one for her to come to and that she does not generally attend. Monroe said she decided to come to this year’s Trans Day of Remembrance because she felt a stronger need for her community. Monroe said she thinks the political climate puts emphasis on events that bring the transgender community together, like Trans Day of Remembrance. Monroe said people who engage in fearmongering will never have to feel the effects of it, unlike her. “I think it’s very important to be active [in] standing up against that,” she said.